You'll be £11.99 closer to your next £10.00 credit when you purchase FOCKE-WULF Fw 190. What's this? The Focke-Wulf Fw 190 was widely regarded as the Luftwaffe’s finest fighter. It first saw service in France in August 1941, immediately proving itself at least the equal of the then latest Spitfire variant, the Mk.V. There were a number of characteristics which contributed to the Fw 190’s success. The first of these was that it had been designed from the outset to be a weapons platform, rather than an aircraft to which weapons were added, as was the case with previous fighters. This meant that it could carry a wide range of armament in the form of various combinations of bomb racks, cannon pods and, later, unguided rockets. Another element in the Fw 190’s construction which added to its durability was its wide-tracked, inwards-retracting landing gear, as opposed to the much narrower, outwards-retracting landing gear of the Messerschmitt Bf 109. This gave the Fw 190 much greater stability on the ground which resulted in far fewer ground accidents than experienced by the Bf 109. The Fw 190’s BMW 801 D-2 radial engine also produced 1,677 horse power, giving the early Focke-Wulf 190 A-8 a top speed of more than 400 miles per hour – which was considerably faster than the early variant Spitfires. It was the Spitfires with which the Fw 190 pilots frequently had to contend when in combat over the English Channel, and particularly during the Allied raid on Dieppe in August 1942, when more than 100 Focke-Wulfs (from Jagdgeschwaders JG 2 and JG 26) engaged Spitfires and Hawker Typhoons, claiming sixty-one Allied aircraft ‘kills’ against just twenty-five losses of their own. The Fw 190’s weapons capability also saw it used as a fighter-bomber. The Fw 190 A-3/U3 Jabo was used with considerable effect against Allied shipping in the Channel and against the south-eastern coasts of England in 1942 in tip-and-runs raids. These fast, low-level attacks proved very difficult for the defending RAF squadrons to counter and only one Fw 190 was lost on these operations. 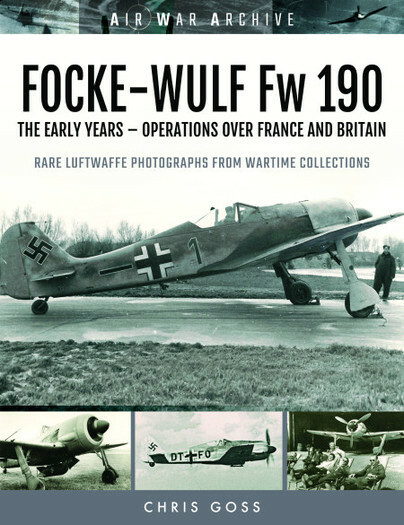 If you are looking to add a good quality and inexpensive Fw 190 title to your library then this is it. A solid and useful contribution to the enthusiasts library. The photo collection is first class, and the bulk of which I had not seen before... Modellers will enjoy the details seen in many of the photos and there are some great diorama display ideas. The dispersal of aircraft among trees and with foliage arranged around the parked aircraft, plus some individual hangers just large enough for an individual aircraft. One detail which grabbed my attention in the final chapter shows an array of cannon ammunition laid out on a tray in front of the aircraft, and that tray has been fitted onto what is clearly on old civilian pram, or perhaps better described as a 'baby carriage'. All together another fine addition to the Air War Archive series from Chris Goss and Frontline Books.